Almost every woman who's tried them on loves the feel of "Healey," a comfort-minded strap casual from easyB, England's wide shoe experts. 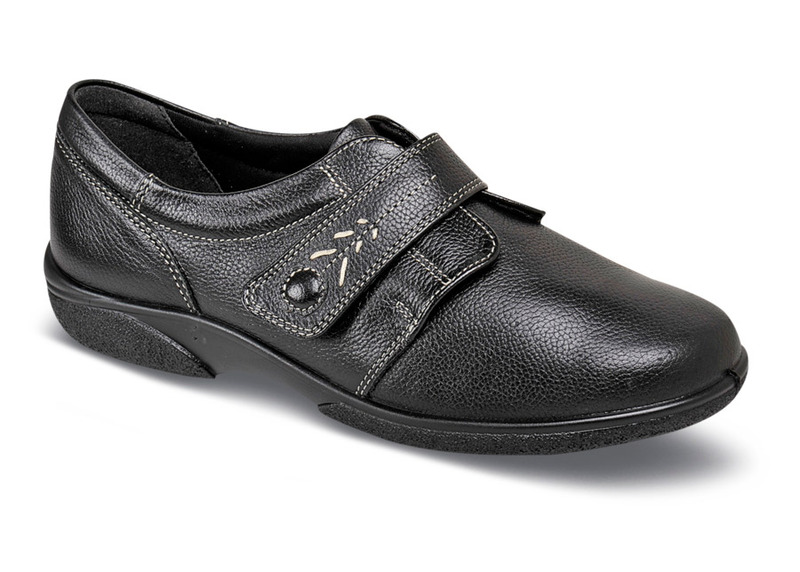 Made in England in widths to 6E, it has soft uppers of black grained leather with a seam-free toe box, smoothly padded textile linings and an attractively detailed self-securing strap. The leather-covered insole is removable to accommodate orthotics. The lightweight outsole has built-in air bubbles for extra cushioning. Made in U.K. sizes equivalent to U.S. women's sizes 5, 6–10 and 11 in 2E; whole sizes 5 to 11 in both 4E and 6E and now in 8E, too!